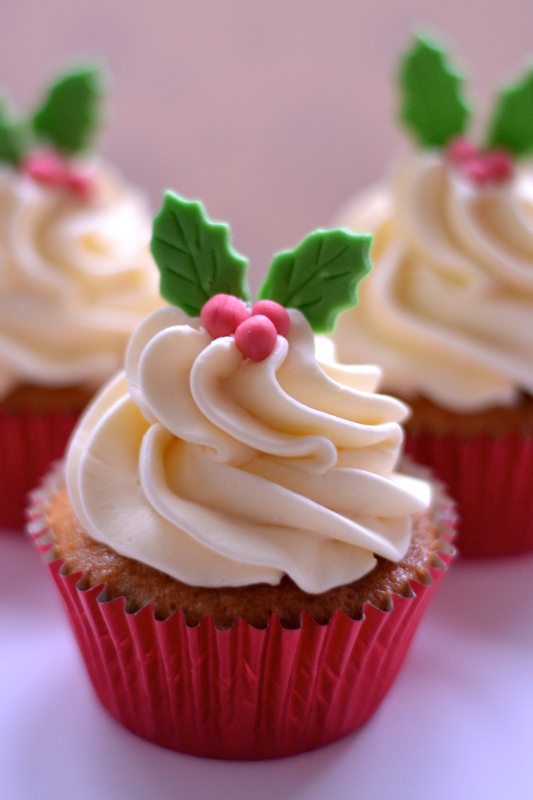 Mince Pie Cupcakes with Brandy Buttercream – Gorgeously light and fluffy mince pie flavoured sponge topped with a delicately flavoured brandy buttercream. 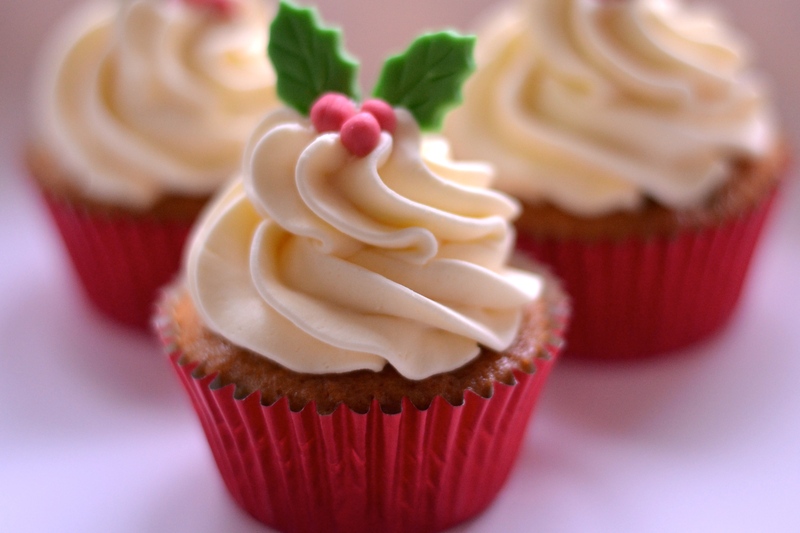 The perfect cupcake for Christmas! I love Christmas. Like, LOVE Christmas. I am one of those folk who starts getting excited in October; who changes their playlist to their ‘Christmas playlist’ in November (everyone has a Christmas playlist right? ); and has the tree up punctually on the 1st of December. The Husband thinks I’m hilarious – he tries to be all Bah Humbug but I’m sure he secretly likes it. And since having kids, Christmas has just gotten even better. They’re at an age where they still all fervently believe in the big man. We have an elf (oh yes, we’ve joined the legions of parents panically moving a little felt toy around the house every night), we’ve watched Christmas movies (this is totally indulgent for me to be honest), they’ve made Christmas cards (in Alice’s case, about 10 each for her teacher and TA because they didn’t have any – I hope they’re feeling special), and they are so excited I’m just waiting for one of them to pop. There are certain foods that go hand-in-hand with Christmas for me. I always start making sausage rolls around this time. We currently have a freezer full, ready to bake whenever the need arises (pretty much every lunchtime in the Husband’s case). 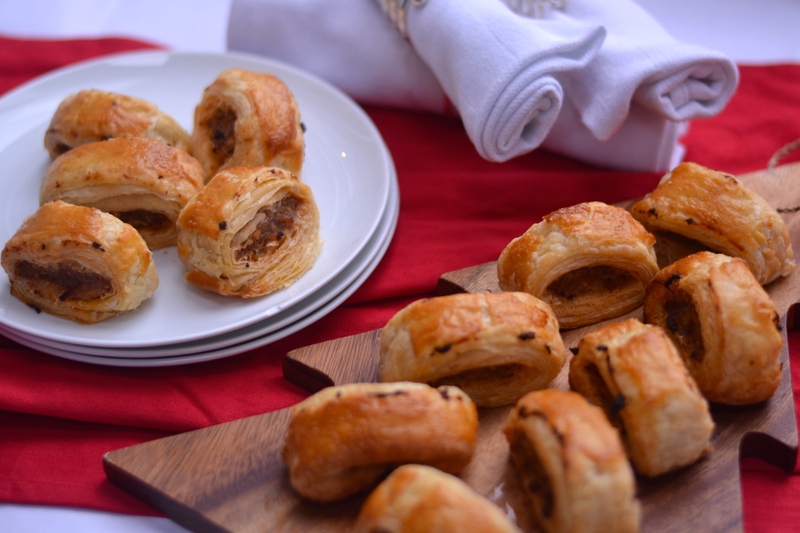 If you haven’t already, do check out my sausage roll recipe here (and team them with my Quick & Simple Lentil Soup). I started making these cupcakes years ago, it was another Delicious magazine recipe. They’re a lovely alternative to mince pies, lighter too, whilst still getting that mincemeat hit. If you’re not a fan of mince pies, but like dried fruit and the gentle spices of mincemeat, these cupcakes could be your perfect option. They’re really simple to make, and you can decorate them however you’d like, they don’t have to be fancy. I’m not a fan of brandy, or anything alcoholic near my sugar fix to be honest. Chocolate and liqueur? Bleugh. Boozey trifle? Wrong-diddley-wrong. Your taking two perfectly good things and completely spoiling them. In my humble opinion. However. When I first made these cupcakes I was making them as a gift, so figured I’d shove in the brandy as per the recipe since they weren’t for me (I’m a totally selfish cook by the way). I did have a little old taste test though. And by jove, these are better with the brandy buttercream. I promise. It’s only a subtle flavour, but it lends itself exceptionally well to the mince pie cakes. 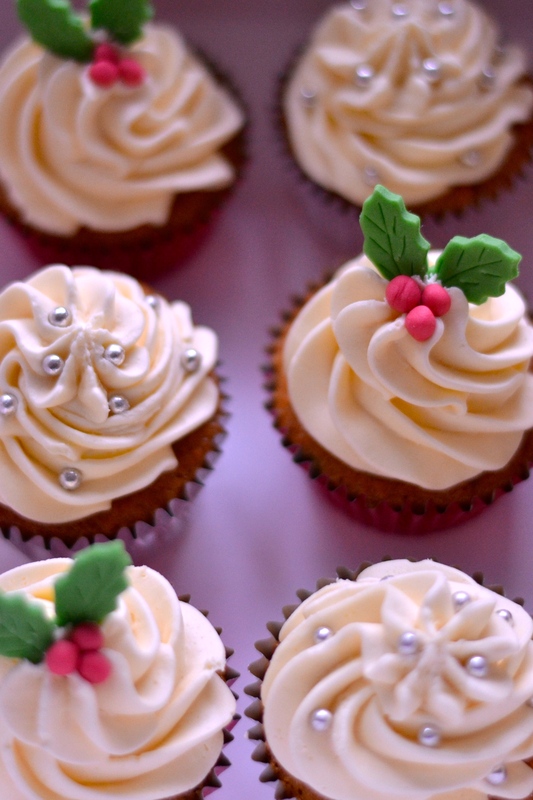 If you have to take a sweet bite anywhere this Christmas, you can’t go far wrong with these cupcakes. I actually made them for my kids’ teachers and TAs. Four teachers and three TAs, I made a box for each class which is possibly a bit cheap, but at this time of year any saving is a bonus! Preheat your oven to 180C (fan 160C/gas 4), and line a muffin tray with cupcake cases (Christmas theme optional – but preferable). Place the butter and sugar in a bowl, and cream together using an electric mixer until pale (if you don’t have an electric mixer, you need one to make good cakes – that or mega biceps as you’ll be hand mixing for ages…). Add the eggs, one at a time, beating each time. Fold in the mincemeat and stir until well incorporated. Add the flour, baking powder and cornflour (being sure to sprinkle the baking powder and cornflour evenly over the flour to avoid clumps – this negates the need to sift). Fold in. Fill each cupcake case about two-thirds full. Bake for 20-23 minutes until risen and golden. Cool in the tin for about 10 minutes, then place the cupcakes on a wire rack to cool completely. Beat the brandy into the buttercream, taste, and add more as required. 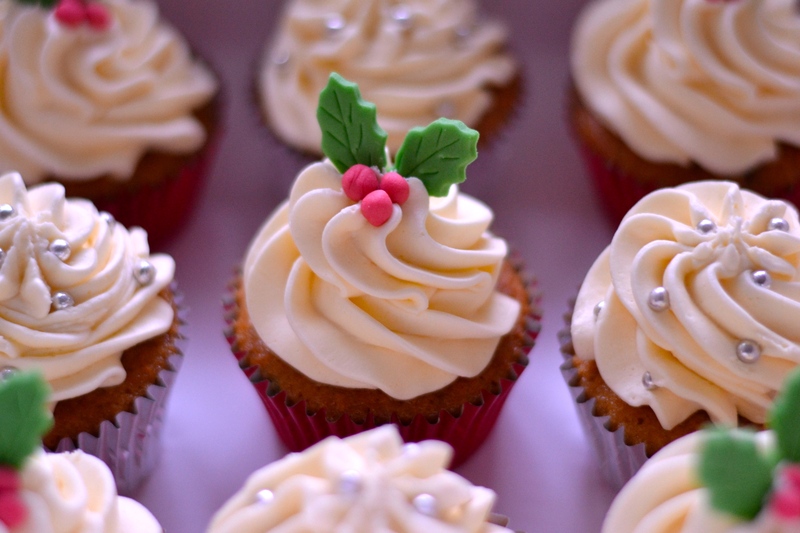 It should be a subtle taste, but it really sets off the mince pie cupcakes. Top your cupcakes with the buttercream.